Warning: Leave your misty memories about cannoli, spaghetti and meatballs at the door. This is not your parent’s North End. 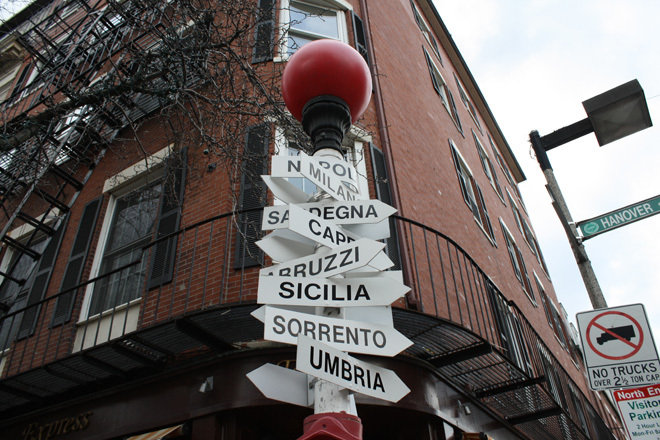 Often called Boston’s “Little Italy” (though not by the locals) the area is deeply rooted in Italian culture and American history. Despite hordes of tourists traipsing through its narrow cobblestone streets day after day, the North End has managed to maintain its old world charm and embrace new business, new blood and new surroundings. Long before Italian immigrants settled in the community, the North End housed one notable resident you may be familiar with – does the name Paul Revere ring a bell? Back in 1775, Revere, a patriot in the American Revolution, began his midnight ride from his North Square house. From the North End, Revere rowed across the Charles River to Charlestown, borrowed a horse, and the rest – well, that’s American history. Each year, millions of tourists trace Revere’s steps via the red brick Freedom Trail – which makes stops at Revere’s home and the Old North Church. 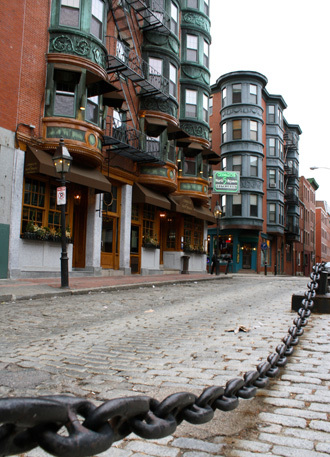 For two centuries following the American Revolution, the North End became home to a number of immigrants. These African, Irish and Jewish newcomers came in waves. The Italians were among the last group of immigrants to settle in the North End arriving in the late 1800’s. From the turn of the 20th century, the neighborhood remained predominantly Italian. Though the borough has been gentrified over the past few decades, Italian culture reigns supreme and is evidenced by the culinary delights that pack the dense area. Despite its high number of thriving businesses, and tourist draw, the North End has remained a close-knit residential area. 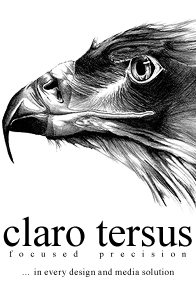 Today, over 10,000 residents reside within one square mile, a 5.1% percent increase from ten years ago. Unlike many Boston neighborhoods, the North End seems to have escaped the range of stereotypes that plague each area. With labels ranging from snooty to gritty, the Hub’s inhabitants have been stereotyped into three categories: 1) Hardened hometown boys; 2) Brahmin blue-bloods; and 3) college kids. The North End has managed to fall somewhere in the middle. A look inside the doors of any of the North End’s neighborhood joints reveals lifetime residents, empty nesters, professionals, and students existing in harmony. The completion of Boston’s infamous “Big Dig” showed the North End in an entirely different light – literally. With the neighborhood no longer under the shadow of the Central Artery (where it had been since the 1950’s) – the North End once again revitalized itself, adding a number of small businesses and restaurants. You see, small businesses are as much of a part of the North End culture as garlic. For a place that sees a lot of foot traffic and even more fanny packs then the rest of town, the North End is far from a “tourist trap”. If you’re looking for a Dunkin Donuts iced coffee, better grab one before you hit Hanover Street. 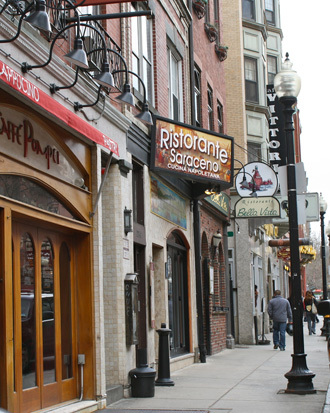 The North End’s main thoroughfare is packed with block after block of restaurants, bakeries, grocers, boutiques, and coffee shops – but none with name’s you’ll recognize. There’s no lack of entrepreneurial spirit in this locale – new businesses pop up each season – and the neighborhood’s residents are happy to support and embrace each newcomer. With 24 hour bakeries, salumerias, summer festivals, improv comedy, art galleries, coffeeshops, bocce courts, over a hundred restaurants and not to mention a spectacular waterfront view, the North End remains one of the most intrinsically different and unique neighborhoods in New England. Check back next month for An Overnight in Boston’s North End and get the inside scoop on where to sleep, nosh, imbibe, and shop.